Like life, blogging is a journey and you change and develop along the way. I realised the other day that my About Me page had not been updated for about 4 years, and that Fuss Free Flavours will be 6 this week! My first post was for lemon chickpeas, cooked in a spicy tomato sauce with some added spinach. Affordable, healthy, unpretentious, delicious food that anyone can make. Despite needing a refresh, the About Me page is still pretty accurate. Generally fuss free, non cheffy food that is largely plant-based. Affordable and good for both you and the planet. It is, I think a good description? Perhaps I have not changed so much after all. This is a very simple tomato sauce, with a handful of lentils thrown in to add protein and dietary fibre to the dish. I use this on pasta and as a pizza topping; the extra protein in the sauce means you can add fewer toppings and still feel full. 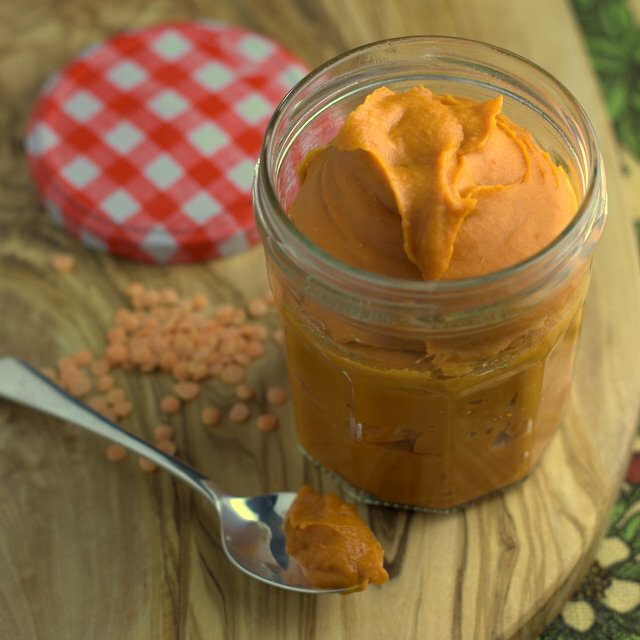 Blitzed to silky smoothness in a blender the lentils are disguised making this perfect to give to fussy children. The balsamic vinegar adds a touch of sweetness and colour. If you do not have a jug blender you can blitz this in a food processor or with a stick blender. You may want to also try my beans in a tomato sauce recipe. If you try this Recipe: Tomato Sauce with Lentils please tag #FussFreeFlavours on Instagram or Twitter. It is amazing for me when for me when you make one of my recipes and I really do love to see them. You can also share it on my Facebook page. Please pin this recipe to Pinterest too! Thanks for reading Fuss Free Flavours! Add the oil to a medium frying pan, saute the onions and garlic until soft and starting to turn golden. Add the tomatoes, lentils and half a cup of water. Turn down the heat, cover and leave to simmer for 25 minutes or until the lentils are soft. Check every 5 minutes or so, adding more water so the mixture remains runny. Transfer to a blender – I use my Vitamix, add the sun dried tomatoes and some of the oil from the jar, and blitz to a silky smooth paste, add a drizzle of water if needed to thin – you want a spreadable, but not runny consistency. Season to taste with the balsamic vinegar and salt and pepper.